Here's a collection of old Marquee Press ads, in chronological order. 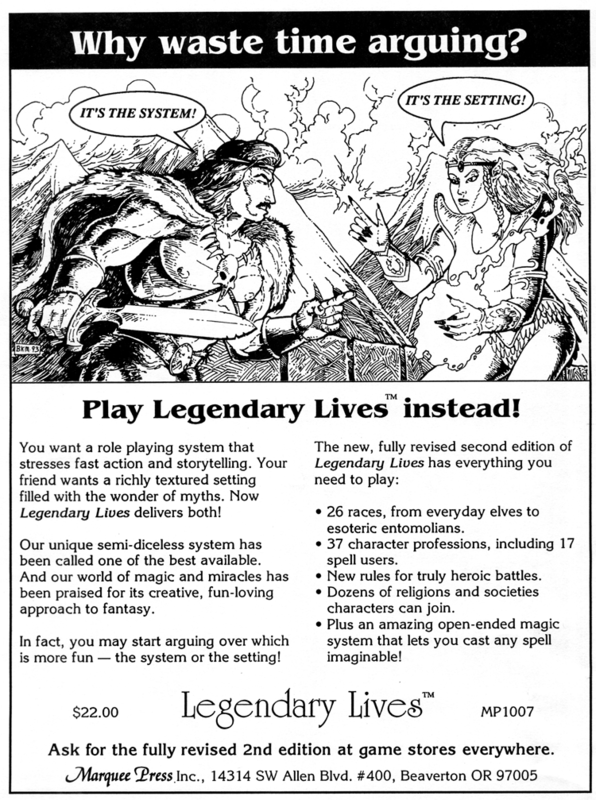 We start with one of the first ads for Legendary Lives. 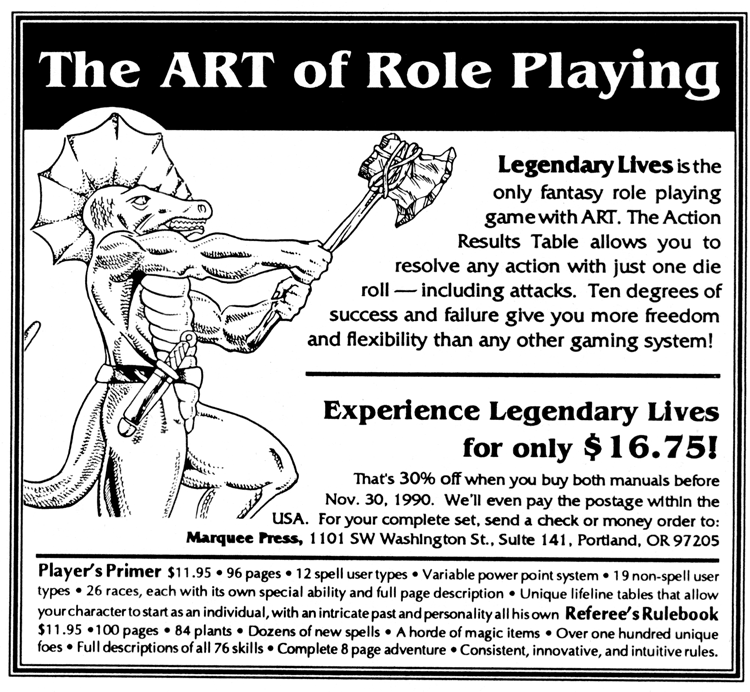 Since no one really knew anything about Legendary Lives, we started running text-heavy ads to explain what it was about. I don't remember who drew the lizard man, but it was the best picture we had at the time. It didn't matter that there were no lizard men in the game. 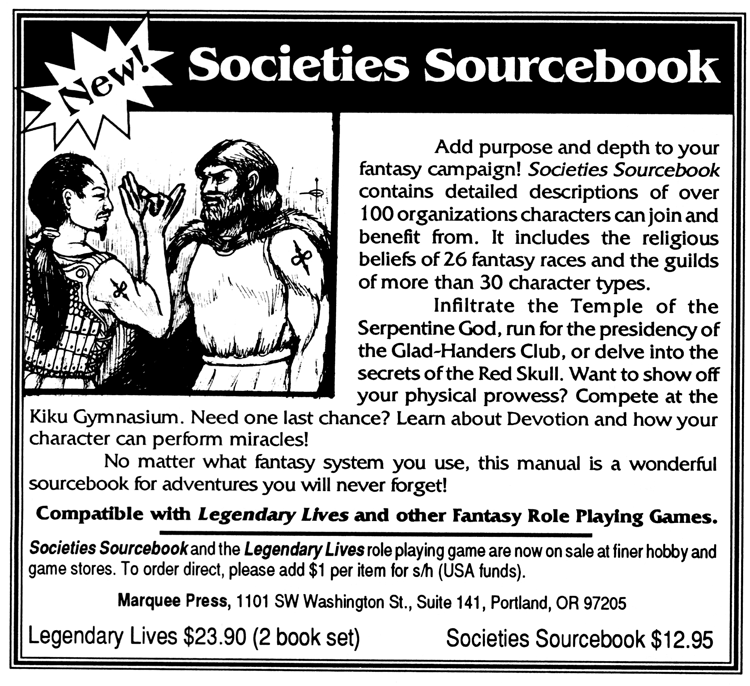 The Societies Sourcebook for Legendary Lives came out next. The book was perfect bound with a full-color cover, but was produced in such small print runs that it was hard to make any money from it. When we ran out of perfect bound copies, I had to hand staple a few copies together to fill an order for about a half dozen units. 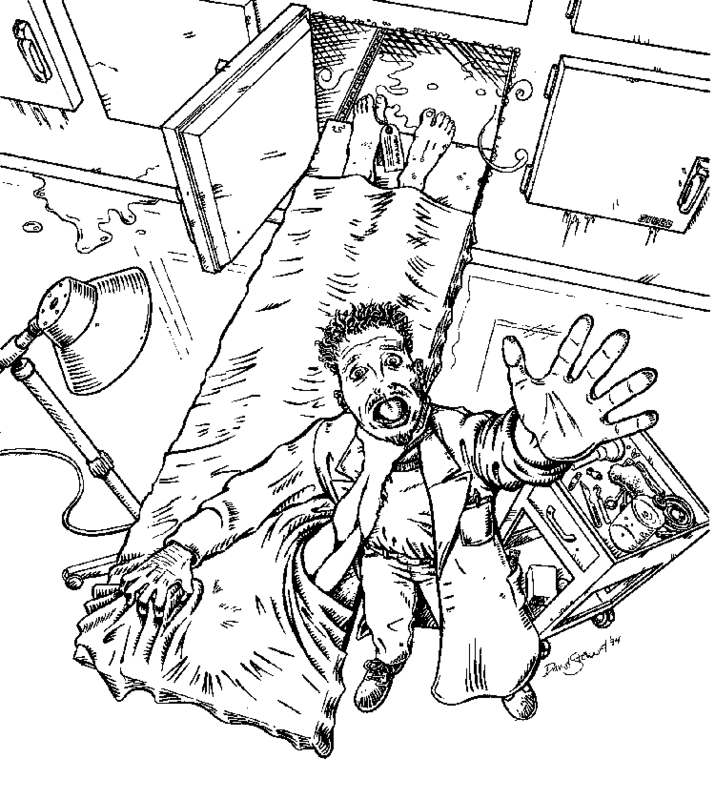 That was a low point in my publishing career and it still makes me shudder. We replaced the order with perfect bound copies as soon as we did another run, but it taught us that we needed to cut back our expenses on our next product if we wanted to stay in business. 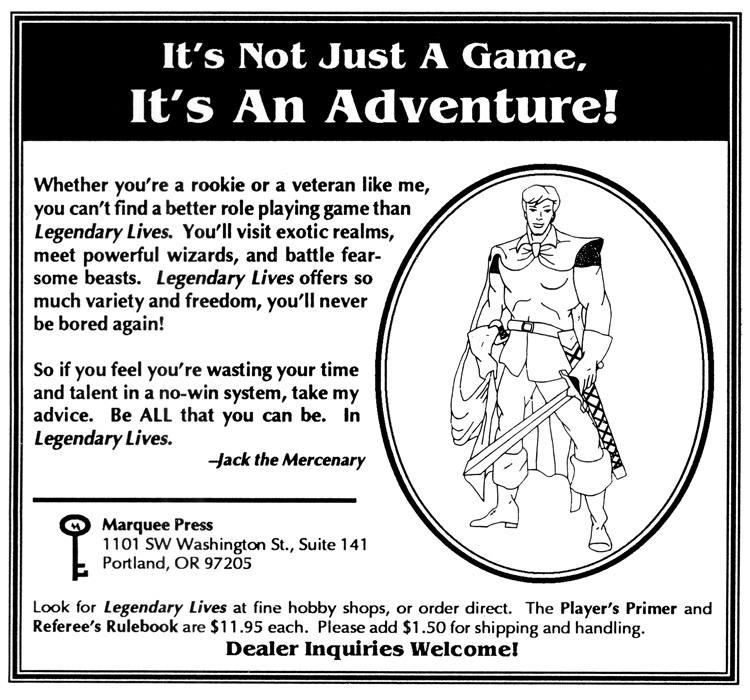 We supported Legendary Lives with adventures published in various magazines. The slow sales of Societies Sourcebook convinced us that publishing support material for Legendary Lives would bankrupt us. We decided to do something completely different. In an attempt to capitalize on the popularity of the movie Ghost, we created a game about the afterlife. This early ad features the title we were using during development. 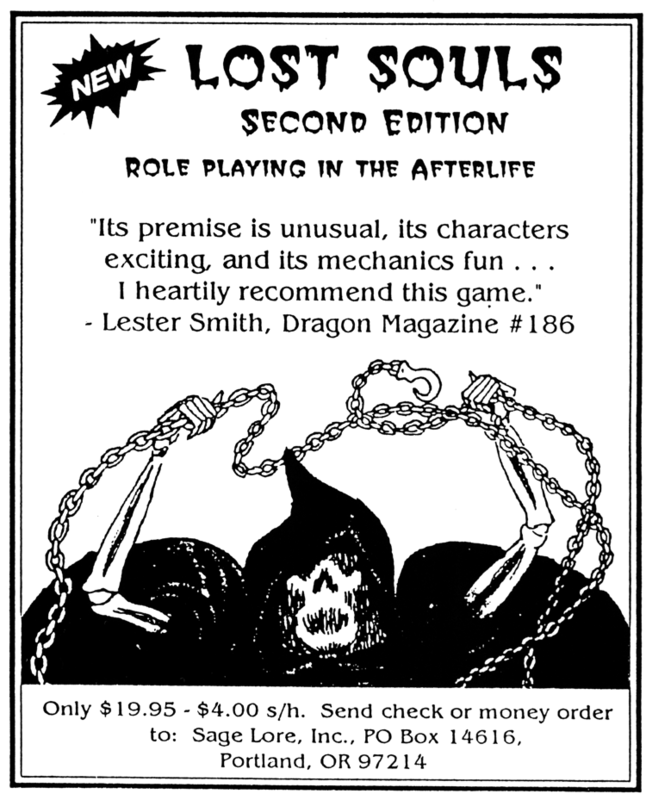 Between the placing of this ad and publication we came to our senses and changed the name to Lost Souls. 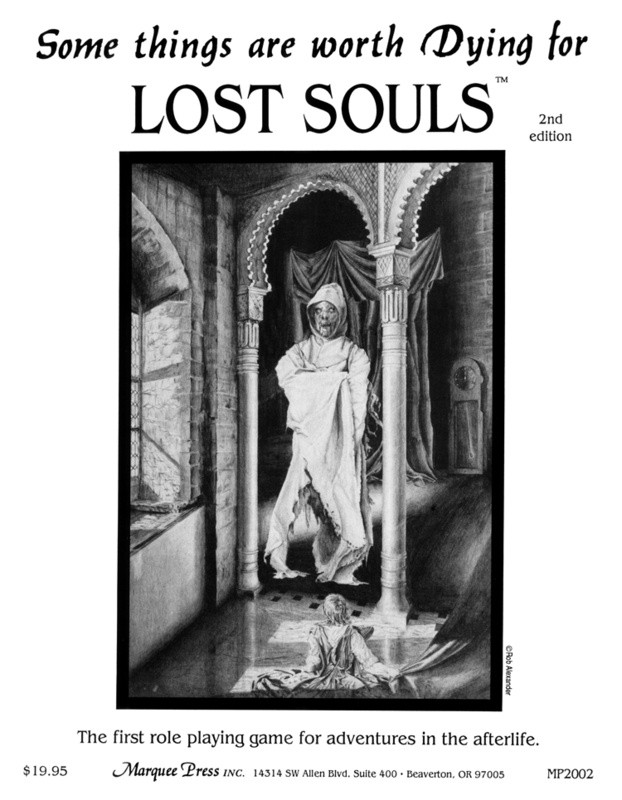 We didn't want to get stuck with another book that we couldn't afford to publish, so Lost Souls was spiral bound with a black and white cover. The whole thing was printed on what was then a new-fangled digital photocopier. We didn't make much off of each copy, but at least it was sustainable for a small company. Thanks to positive reviews, Lost Souls sold better than we ever expected. But because of our conservative printing choices, we were making pennies off each copy and we didn't have the money to make the jump to a better production. Marquee Press hooked up with Sage Lore to produce a perfect bound second edition with a color cover. 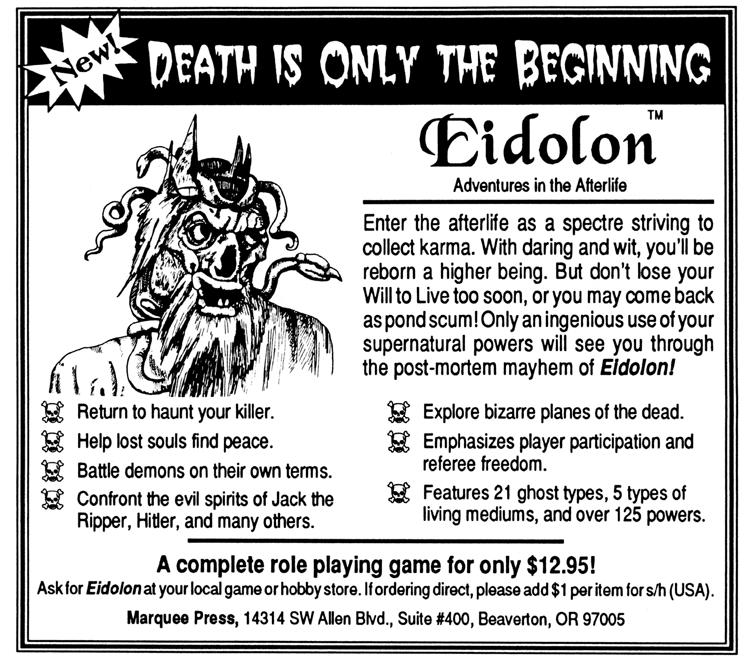 Here's the only ad I have from the Sage Lore days. It wasn't long before Marquee Press started selling Lost Souls. We hooked up with better artists and came up with variations on this next ad. This is the long version; smaller versions eliminated most of the text. 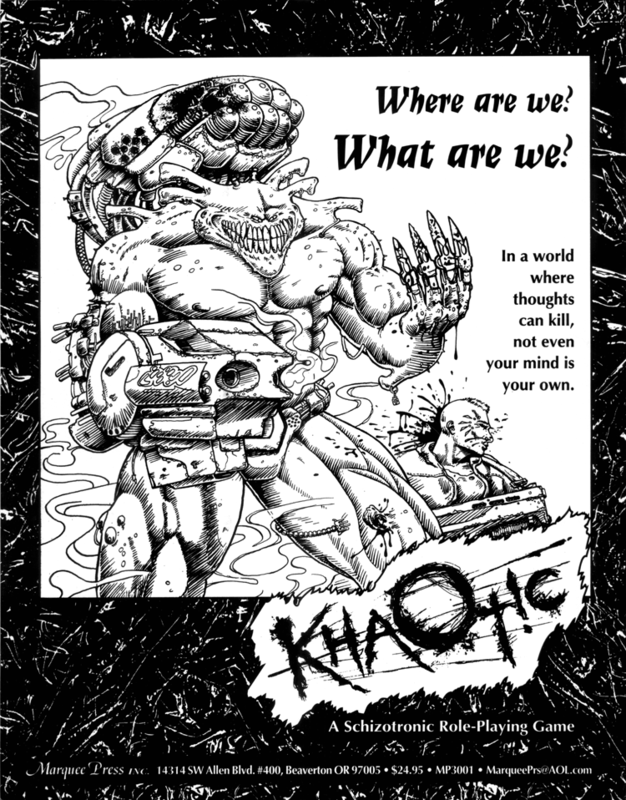 Around this time we also produced this rather nice flyer that we handed out at conventions. 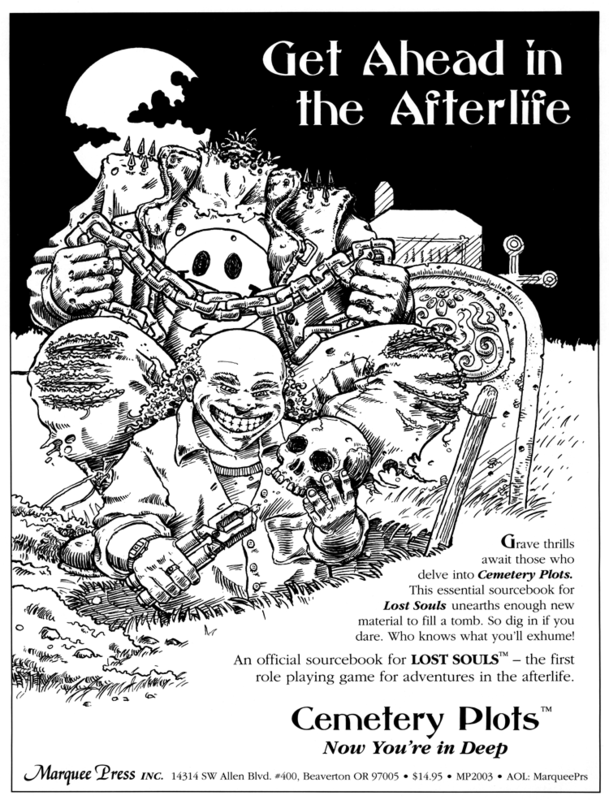 It features art by Rob Alexander. Using the income from Lost Souls, Marquee Press released a second edition of Legendary Lives. In Legendary Lives, I did the system and Kathleen did the setting. I like the way this next ad highlights our different approaches. Now that we had finally given Legendary Lives the treatment it deserved, we chanced another supplement but this time for Lost Souls. Featuring art by Dave Stewart, this is by far my favorite ad. 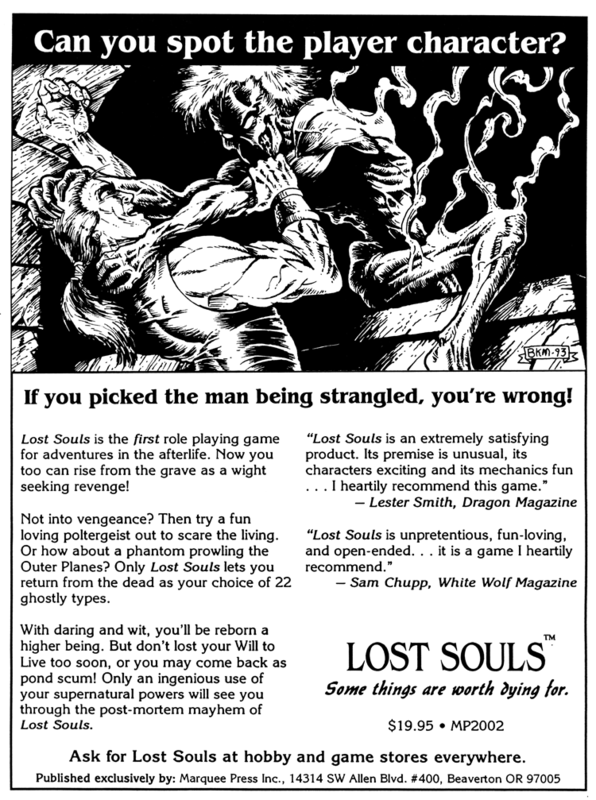 Dave Stewart also produced this artwork for another Lost Souls ad, possibly for the ill-fated Charnel Knowledge, but I can't find the ad. 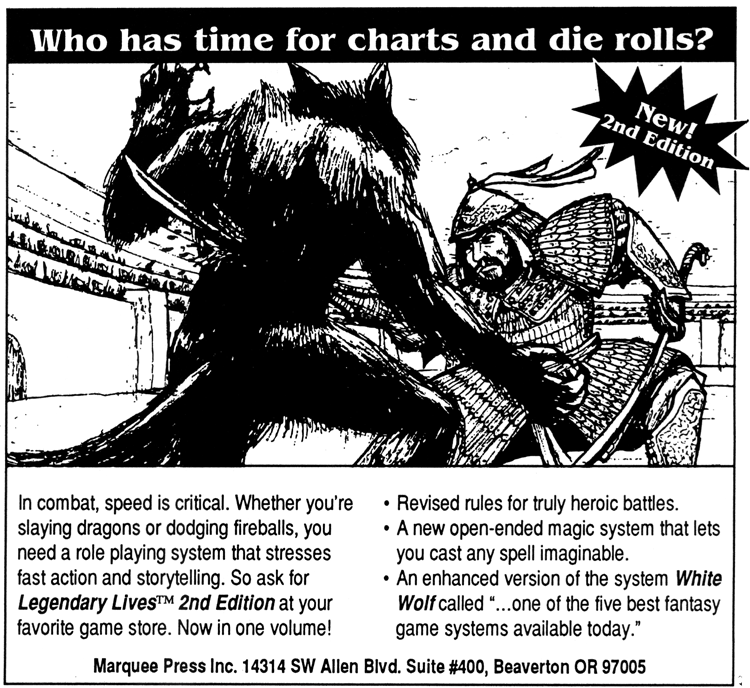 The last ad Marquee Press ever did also features artwork by Dave Stewart. Thank you for accompaying me into the hidden corners of the Haunted Attic.